GuitarTricks.com is now offering a free trial membership for 14 days from signing up. 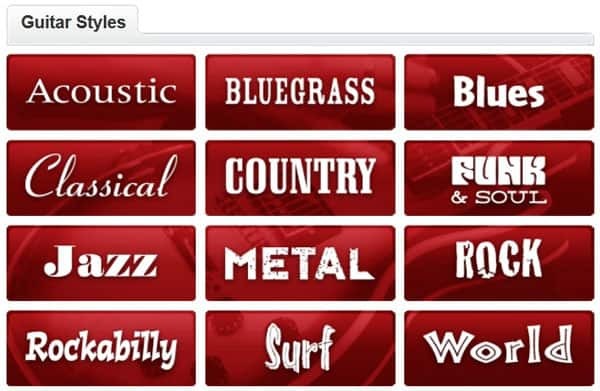 After the trial period, you will automatically become a monthly member, and be billed $19.95 per month for the remainder of your membership at GuitarTricks. 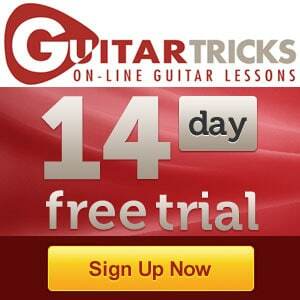 Here are the steps you need to take to get access to GuitarTricks for 2 weeks for free. Register an account for yourself using your email address or facebook. The way the Guitar Tricks free trial works is that you need to give your credit card or PayPal info already during signup. But you won't be billed anything until the 14 day free test period is over. This is a totally risk-free process, so if you have been planning on giving GuitarTricks a shot, now is the best time. You have 2 weeks to test every aspect of GuitarTricks, including the thousands of lessons, online guitar tools, and guitar learning games. If you don't like what GuitarTricks is all about, you can cancel your trial membership easily at any time during the 2 weeks. Canceling is easy, you simply log in to your profile on GuitarTricks, and click Cancel. But of course, if you like what the site is all about, you may want to save some money by signing up for a longer period, as can be read on this Guitar Tricks discount page. We have spoken excessively about GuitarTricks in the past, and our findings can be read in this GuitarTricks review. There are also many other reviews of GuitarTricks.com available online. If you are looking at studying the electric guitar on the internet, GuitarTricks is without a doubt a good choice. You can find video guitar lessons addressing all different guitar styles , therefore it caters to everyone from complete newbie to skilled guitarists as well. The video guitar lessons are structured and classified in a number of ways, which is a must, given the number of guitar lessons readily available. A great feature for more knowledgable guitarists is that the search function lets you find lessons in the styles of well known guitar icons. This segment of GuitarTricks is called “By Inspiration,” and this allows you to find tunes played by guitarists from Eric Clapton, to BB King, to Eddie Van Halen to Jack Johnson, and more..
Great structure, all lessons are easy to locate. Special courses designed to take guitarists step-by-step through many styles of guitar, including total beginner course, blues course, country course, etc. Excellent search function, so that you can navigate the many video lessons. One of the best attributes we found through our evaluation of GuitarTricks is that video clips on the website are downloadable, and you also get a cost-free video player to watch them with. Because GuitarTricks was the earliest video guitar tutorials website online, about 2% of their total videos are older, and thus of lower quality. Giving a try and signing up for the GuitarTricks free trial membership for 2 weeks is a no-brainer really. Learning to play acoustic or electric guitar with the aid of GuitarTricks is actually a completely good alternative to hiring a private guitar teacher, since GuitarTricks offers a whole array of advantages, which a personal guitar tutor simply cannot offer. Can I sign up for the free two week trial and if I like the program, then sign up for an annual membership at the discounted $143.20? Thank you. Yes, just cancel your initial sign up, so that doesn’t get billed after 2 weeks. I signed up today 10-5-16 from the App Store and gave my credit card information and was charged $19.95, I was not offered a 14 day trial and then a rate of $14.95 as stated on this site. Could you please explain how that works. Thank you for your time. Hi, I don’t know if the free trial offer works through the App Store. If you would have signed up through my site, you would have clicked the link at the top of the page, and it would have taken you to the free 2 week trial signup page. Like that, your card wouldn’t have been charged for 2 weeks. No worries though, they have a 60 day refund period, so test everything as you would have, and if you don’t like it, just ask for a refund. Actually it’s a free trial but with strings attached(no pun intended). You have to give them your payment information and then they charge you after the 14 days. Sounds dodgy to me. Does not encourage me to sign up, knowing how so many business’s scam so much these days. I can assure you that it’s not a scam 🙂 Cancelling is all automatic actually, there is a cancel button in your account page. Just press it, and it’s cancelled.